We can hear the bells! Following The Wiz, Peter Pan and The Sound of Music, NBC’s latest musical broadcast is almost here: Hairspray Live!. This musical is timeless to theater fans, and the starry live event is Broadway.com Editor-in-Chief Paul Wontorek’s Save the Date pick for the month of December. We’ve pulled together some frequently asked questions about the big, beautiful broadcast so you can find all of the answers in one place. Run and tell that! What is the story of Hairspray? 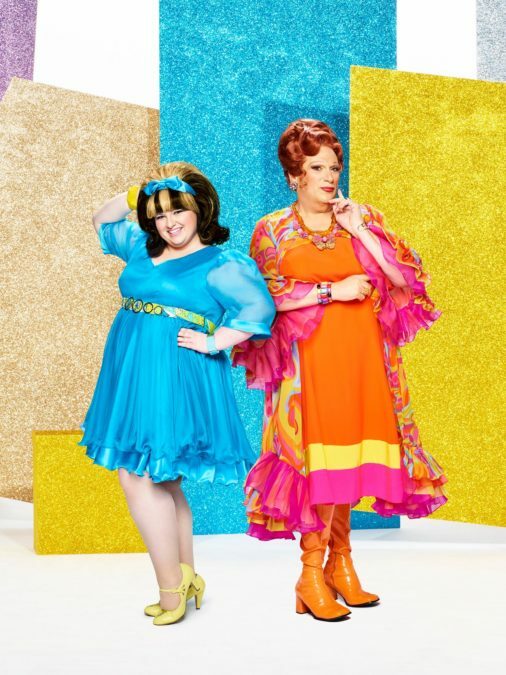 Hairspray follows plus-sized teenager Tracy Turnblad in 1960s Baltimore as she attempts to become a cast member of The Corny Collins Show, a popular local dance TV series. Tracy soon finds herself leading a civil rights campaign to integrate the show. The 1988 film version was written and directed by John Waters, and the original Broadway version garnered Tony Awards for composer and lyricist Marc Shaiman, lyricist Scott Wittman and scribes Mark O'Donnell and Thomas Meehan Kenny. Hairspray also took home the 2002 Tony Award for Best Musical, and the story returned to the silver screen in a 2007 film starring John Travolta. The Wiz Live! director Kenny Leon is back at the Peacock network to helm the live television version; both Jerry Mitchell and Harvey Fierstein of the original Broadway production are also on the creative team as choreographer and book adapter, respectively. Caught up? Cool! Get hyped up with the promo below! When does Hairspray Live! air? Wednesday, December 7 at 8/7c on NBC. How can I prep for Hairspray Live!? Hairspray Live! stars Kristin Chenoweth and Sean Hayes will host a live half-hour pre-show, Countdown to Hairspray Live!, airing at 7:30PM on NBC on December 7. The special will give viewers a glimpse into the last-minute backstage preparations before the telecast, as well as a look at the casting process, rehearsals and design of the production. Fellow Broadway.com Audience Choice Award winner Darren Criss will also appear on the pre-show. Psyched? We thought so. In the meantime, check out Broadway.com’s piece on why Kenny Leon thinks Hairspray Live! is necessary following the 2016 presidential election, a history lesson of the Baltimore streets and a feature on what makes this event the Super Bowl of theater. Plus, watch the cast’s Thanksgiving Day Parade performance on repeat below. How can I watch Hairspray Live!? Tune into NBC from 8/7c to see the big, beautiful broadcast. Be sure to follow Broadway.com on Facebook, Twitter, Instagram, Snapchat and Tumblr for live updates, fun GIFs and more! Can I watch Hairspray Live! if I'm not in the US? Those in the UK can catch Hairspray Live! on ITV2 on December 9, and fans in Australia can tune into SBS on December 10. Check local listings for more info. Who is playing leading lady Tracy Turnblad? After an open call that had over 1,000 Tracy hopefuls hitting the pavement to play the huge-hearted character, Texas native and Marymount Manhattan College student Maddie Baillio is set to make her screen debut in Hairspray Live! (not a bad breakout gig). Broadway.com interviewed the newcomer following the big casting news and has since learned about her “full out” Hairspray Live! journey, her obsession with Michael Bublé’s Christmas album and her cast crush! What fun stuff can I do during the broadcast? Criss will give fans a behind-the-scenes look throughout the broadcast, dropping in during the performance with updates and will also host a Facebook Live digital companion show. Make sure to have all your devices at the ready to watch the broadcast, Criss and (of course) live tweet. If you’re already following us on social media, you know we’re going to have a good time together! You can also follow members of the Broadway.com team on Twitter: Editor-in-Chief Paul Wontorek (@PaulWontorek), Managing Editor Beth Stevens (@beebea) and Senior Editor Imogen Lloyd Webber (@illoydwebber). Which stars should I look out for during the broadcast? This live musical has a supremely star-studded cast! Fierstein returns to his Tony-winning role as Big Mama Edna. Music superstar Ariana Grande returns to her Great White Way roots as Penny Pingleton. Oscar and Grammy winner Jennifer Hudson will play Motormouth Maybelle, and Tony winner Chenoweth is set to channel her pageant vibes as Velma Von Tussle. Also on tap are Dove Cameron, Garrett Clayton, Derek Hough, Martin Short, Hayes, Hairspray Tony winner (and Broadway’s original Tracy) Marissa Jaret Winokur, Andrea Martin, Ephraim Sykes, Shahadi Wright Joseph, Rosie O’Donnell, Billy Eichner, original Hairspray film star Ricki Lake and Hairspray’s original Dynamites trio: Shayna Steele, Kamilah Marshall and Judine Somerville. Phew! Got all that straight? Awesome! Follow Broadway.com to the Hollywood backlots to catch up with a few of the superb stars below! How can I listen to the soundtrack/see the broadcast after December 7? Good news, Hairspray Live! viewing party planners! The cast album is already on Spotify. (“You Can’t Stop the Beat” is a fan favorite.) Want to share the Hairspray love for the holidays/binge the show again and again for yourself? The original soundtrack to Hairspray Live! will drop on December 9, with the DVD of the telecast scheduled for release on December 20.